Tour of two well-established native plant gardens in Mirriam Park and Hamline-Midway neighborhoods of St. Paul, both within 5 miles (10 minutes) from Landscape Revival at Roseville Community Pavilion. Featured in several books, Susan and Paul's highly visible garden has a well-established prairie front yard, hedgerow of shrubs near sidewalk and woodland plantings near house. Landscaped for wildlife, gardens offer an urban oasis for migratory and year round birds, butterflies and bees. Arrive early, you may receive a native plant to take home. Native for 20 years, Hannah's gardens include a mix of sunny prairie and woodland native plants. 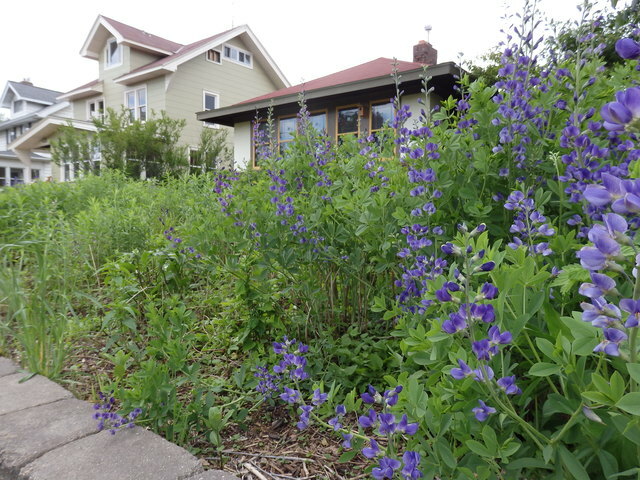 Front yard features sunny butterfly and rain gardens with prairie boulevard and recently seeded short grass prairie hillside. Back yard has a small woodland garden along with a large, sunny prairie garden with fruit and vegetable garden mixed in with native plantings. Tour Questions: For further information email Jim & Jan Coleman, our tour coordinators, or leave a message at our chapter message center, 612-293-3833. 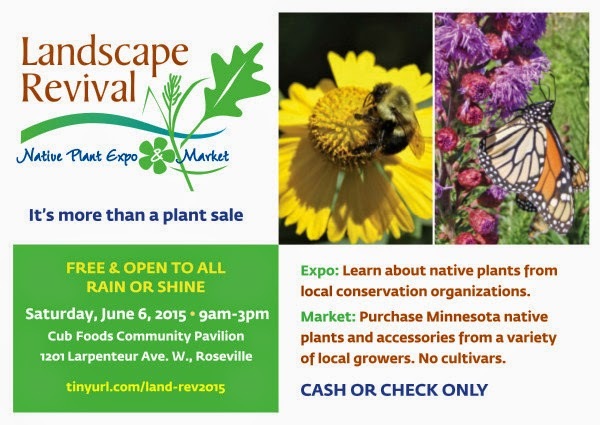 Purchase pollinator-safe native plants at Landscape Revival. Native growers participating in the sale do not use neonicotinoid insecticides. The Landscape Revival | Native Plant Expo and Market offers gardeners one convenient location to shop for Minnesota native plants from 12 local native growers plus learn how to use the plants from conservation organizations. Accessory products such as organic compost, rain barrels and native plant seed will also be for sale. 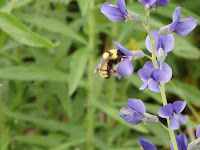 The goal of Landscape Revival is to promote the use of native plants by educating about their benefits for wildlife habitat, pollinators and water quality. The event is sponsored by Saint Paul Audubon, Wild Ones, Native Plants, Natural Landscapes, Capitol Region Watershed District, Blue Thumb and Ramsey Washington Metro Watershed District.